I have written elsewhere about gratitude. 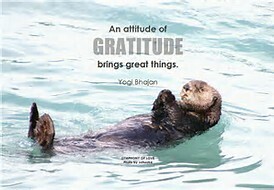 People high in the virtue of gratitude are often high in other virtues as well such as optimism and life satisfaction. They also tend to be more religious. In the previous post, The Psychology of Gratitude, I list some suggestions to increase gratitude. In this post, I refer to a set of items to assess gratitude. The Gratitude Questionnaire uses six items and was published by McCullough, Emmons, and Tsang in 2002. In previous research, the authors found support for one factor. Coefficient alpha, a measure of interitem consistency, ranged from .76 to .84 in samples reported by the authors (McCullough, Emmons, & Tsang, 2002; McCullough, Tsang, & Emmons, 2002). When using the scale in surveys the items are rated on a 7-point scale from strongly disagree (1) to strongly agree (7). High scores indicate a higher level of self-reported gratitude. *The items marked with an asterisk are reverse scored so a score of 7 counts as 1 and a score of 6 become 2 and so on. The total score should be between 6 and 42. A score of 38 was at the 50th percentile in a sample of 1,224. See the link for more information. And, here is a link to research studies using the scale (Gratitude Questionnaire). You will find information on scoring and interpreting the scores. The scale has been used in research studies along with other scales. It may also be relevant in some counseling situations. McCullough, M. E., Tsang, J., & Emmons, R. A. (2004). Gratitude in intermediate affective terrain: Links of grateful moods to individual differences and daily emotional experience. Journal of Personality and Social Psychology, 86, 295-309.